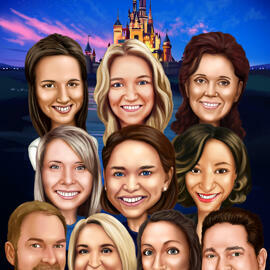 Would you like to preserve your family relations in a sweet cartoon drawing, made in color digital style from photo? If so, we will help you. Our talented artist will draw a cute family couple from photographs as sitting by the fire, swimming in own pool or sitting on the sofa while reading the book. The spot theme is drawn of your choice. You just have to mention ideas and wishes below. If you have not, then we will surprise you, basing on photos and our experience. Such a cute family drawing will make any family member happy because he or she deserves it. We can also drawn your pets with you: cats and dogs, who can sit on lap or lie next to. Hand-drawn Cartoon from Photo will be delivered as a ready to be printed JPG File to your Email by default. It is also available to deliver your cartoon drawing as Printed Photo, Printed Canvas or Original Drawing on A4, A3 Paper. Worldwide shipping.